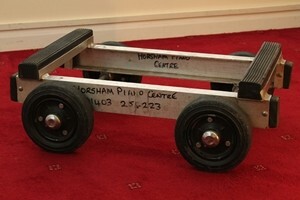 We provide a hire service for piano trolleys. If you decide to undertake the moving of a piano yourself then a good quality piano trolley is a must. With the piano lifted onto one of these manoeuvering the piano is so much easier. It makes light work of shallow steps and is also essential if it needs to go around a tight corner. If you hire a trolley from us and have concerns about how it is best to move your piano we can give you advice on the best ways to overcome your worries. With one of these trolleys it is possible to put the piano on its end if it has a particularly tight corner to negotiate. • £30.00 inc. VAT, per day. • We require a £50.00 cash deposit, paid on collection and refunded on return of the trolley.